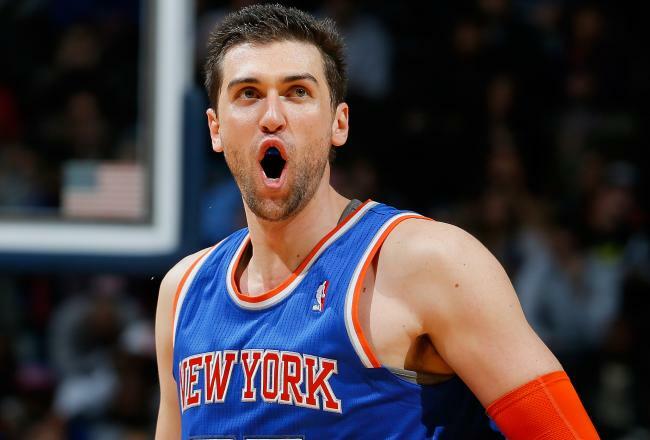 Knicks To Re-Sign Andrea Bargnani? Marc Berman of the New York Post reports that New York Knicks President Phil Jackson is still of fan of Andrea Bargnani and would bring him back for the right price. “Right price” being the operative words here, I tend to agree. I wouldn’t look to give the Italian Stallion more than 2-3 million per year since you’d have to figure there would be little-to-no-market for him. Bidding against yourselves isn’t something you want to do with a guy like Bargnani. Glen Grunwald did that when he traded a first-round pick for him to Toronto in the summer of 2013. Five-year, $50 million contract aside, Bargnani is a nice fit for Phil Jackson’s triangle offense as a big-man coming off the bench getting 20 minutes per night. The big focus this offseason is of course their high draft pick and tons of salary cap space, but New York will have to fill the bench somehow and retaining a skilled big who is familiar with the offense at a good price isn’t the worst idea in the world. For the record, Bargnani has averaged 18.3 points and shot 52.5% from the field over his last six games. He’s scored at least 20 in three of them and double figures in eight of the last nine. A backup seven-footer who can provide some offensive punch coming off the bench? What team wouldn’t want that?